When I got Yackety Smack, I knew it would be an educational game but I really wasn't thinking about what I'd learn. I was honestly most interested in the recorder because I had seen Number 1 Son use a recorder to leave me audio note: "Mom, I broke the drawer handle in the kitchen. Sorry." Something about microphone recorders and even cameras takes one's inhibitions for a trip to not frequently visited places. Working as a publicist in an institution for higher learning I have seen the demeanor of professorial giants change once a sound guy clips a mike onto their collar. For some, the camera can make someone start to shake and stutter. For others, the mike can turn a shy person into the new X Factor sensation. How could you not want to smack this thing? It's so silly looking. 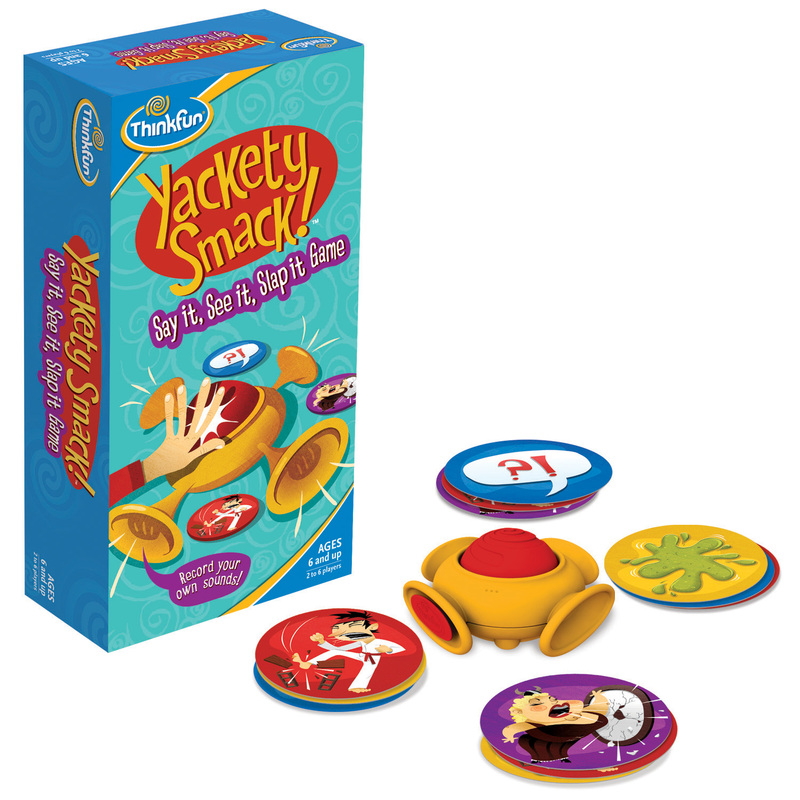 For my kids and I think for many children out there, Yackety Smack's recorder and the game design itself will release kids' inhibitions and will no doubt shorten pathways to sometimes not-so easily accessed centers of their brains. That is the areas of creativity and spontaneity. "I think it is hard for some people. You know they get stuck or feel put on the spot," said New York child psychologist, Gayle Hermann about spontaneity. I love Gayle Hermann's opinions on toys and kids. She has completed hundreds and hundreds of neurological assessments on just about every kind of kid that the world has ever known. She learns a lot about kids when she watches them play and respond to opportunities for creativity and spontaneity. However, with Yackety Smack, she told me that the kids feel silly and goofy and they really let loose. I bet that has a lot to do with the recorder since players are asked to record sounds to represent the cards. Not only does that offer a child an opportunity to associate sounds with images but there are even cards where a child is invited to completely make up something out of the blue. "That really is original and creative," Gayle said. "The goal is to be fun and funny." The other aspect that is great about games that do induce spontaneity is to give kids an opportunity to be spontaneous but then also to turn that off. Practice Outrageous Silliness with Propriety, Okay? Ever meet one of those can't-hurt-a-fly-people who had been super nice to everyone for years and then you see them get mad that one time and they turn into Godzilla? I think this is similar. Sometimes when we don't know how to navigate new behavioral waters, we end up sinking really fast. I saw it with my kids too. Sometimes, they would get so excited, they couldn't stop the silliness. The worst case was Number 2 son who is kind of missing the spontaneity gene. When he gets silly because he loves Yackety Smack and the infamous recorder, he kind of gets too silly and we have to teach him to turn it off. So this is Yackety Smack's secret gift to children! 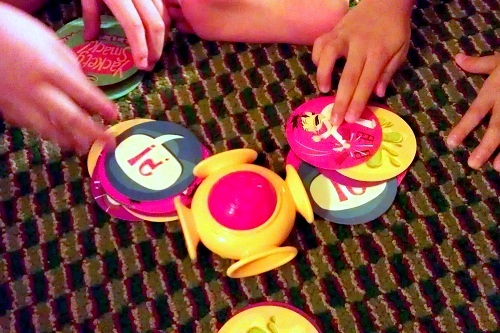 It's a super fun game that is guaranteed to push all those hidden silly buttons on our children! But since it is a game and a good one, our kids can have fun while practicing spontaneity and creativity while learning to regulate themselves. And like a true expert that she is, Gayle was right on target reigning in on the over-silliness. Number 2 Son got really loopy when he first started playing it but as we played more and more, he managed to have a good time without turning into the Tazmanian Devil. Don't forget to watch the video above where he slams his big brother's hand. It's actually very cute! It's so compact, it's not a travel game but it could be. Of course, it came with us to our hotel during our summer vacation. Let's not forget the very core of Yackety Smack. That is, the visual memory and matching aspect to this game which is even more fun because of the speed recognition component. Match before your opponent and you get to keep the cards. Whoever has the most cards wins! It's very simple. But do we really want to emphasize speed recognition? What about all those times when a Toys are Tools review talks about encouraging kids to really see something and focus on those details. "Visual recognition speed is important," said Gayle. "We do it all the time as we start to read. And we know this is an A, and that this is a B, and this is a C and ultimately we get a word and we don’t have to read every single letter. We recognize the word." Gayle then explained to me the concept of "automaticity." What? Is that even a word? An exercise in speed during an evening game. "Automaticity is that we do it automatically, without thinking about it," she explained. "You don’t think when you see a stop sign: 'Oh this is a stop sign. It says stop, it's red, it means I need to put my foot on the break and stop.' You just do it because you’ve been to thousands of stop signs." To be sure, I don't think we are playing Yackety-Smack so that our little ones can start skimming The New York Times by tomorrow but Gayle's point in automaticity (still can't believe that is a word) is something I am going to remember. There is something to be said for speed in recognizing things. For me, it makes me feel quicker and even younger! Thus, I like playing Yackety Smack with my little ones. We all get something out of this very simple game. You will see, everyone will want a chance to grab the recorder and make up the next amazing sound. What will your kids' sounds be? I bet they will all be absolutely delightful! Name the best board game you played when you were a kid. 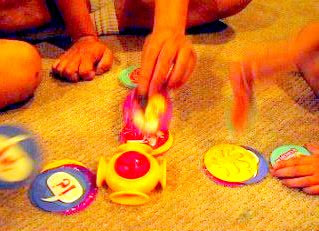 Name your kid's fave board game. Tell us what kind of learning you value most with games... social... critical thinking? What's the make up of your game section? Can't Wait to See Who Won? Here is my Amazon link below. I always liked to play trouble. oh Nicole. That is one of the first games I owned. I remember it well. 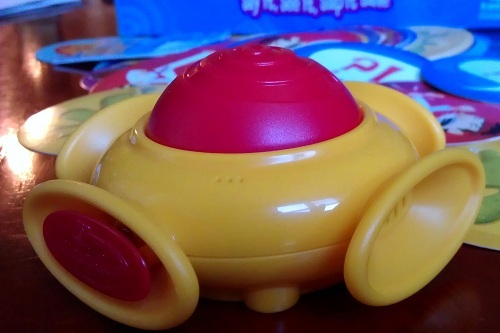 I couldn't speak English at the time but you didn't need to if you wanted to play Trouble. Love that poppy thing. My kids love it too! This is a photo of ours. It's totally scratched up! I liked mousetrap and battleship. Battleship is my child's favorite. It must be fun because if it's not they won't be as interested.